Steve Szirmai is a strategic finance executive with experience building multiple business units from the ground up through to maturity. He is capable of handling business transformations, navigating complex M&A transactions, and bringing a new level of financial and operational excellence and transparency into play. He has strategic management, operations, international business development, business analytics, and financial modelling expertise. Additionally, he is known for his exceptional team building and mentoring skills as a team leader, as well as cultural intelligence. Prior to joining CFO Selections, Steve was a Consulting CFO and COO for various clients in international markets, technology, distribution, financial services, leasing, and vendor finance areas. He was responsible for directing strategic growth and development, often completing buy and sell side M&A, due diligence, valuations, operations, business transformations, SaaS KPI’s and metrics. Prior to consulting roles, Steve was the Director of Worldwide Operations for Microsoft Financing, and he served in numerous management roles throughout WestLB and its subsidiaries in Germany and Europe, as well as Finance roles with HSBC (in New York and Hong Kong), and JPMorgan Chase (previously Chase Manhattan Bank) in New York. 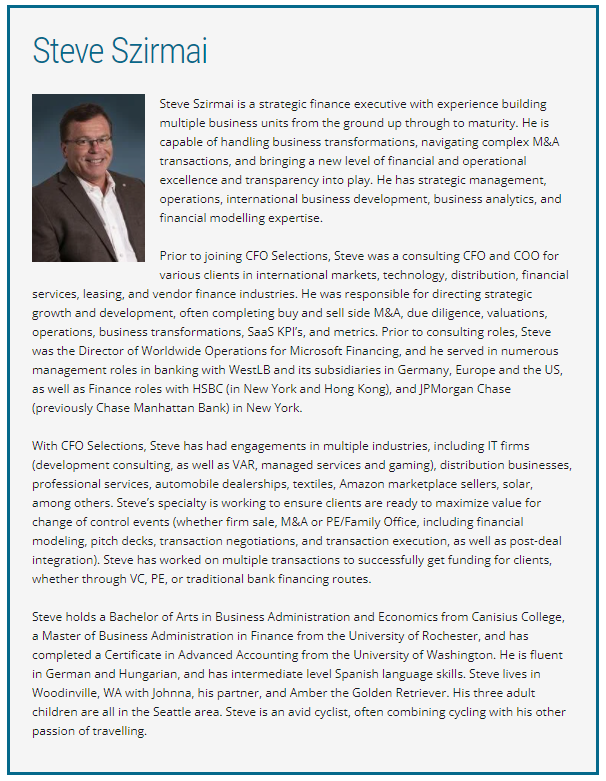 Steve holds a Bachelor of Arts in Business Administration and Economics from Canisius College, and a Master of Business Administration in Finance from the University of Rochester. 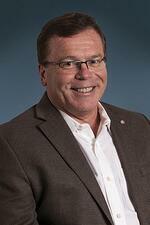 He completed a Certificate in Advanced Accounting from the University of Washington as well. He is fluent in German and Hungarian. Steve lives in Woodinville, WA with Johnna, his partner, and Amber the Golden Retriever. His 3 adult children are all in the Seattle area. Steve is an avid cyclist, often combining cycling with his other passion of travelling.